Yes, even more The Monkey King with Kong! Kong isn’t about King Kong, but is instead about a different famous ape, Sun Wukong the Monkey King. In yet another Monkey King movie news, we’re getting yet another animated Monkey King origin film. The difference is this time, one of the riches men in China is bankrolling it. As you can tell, that’s an obvious difference that will change the game. Or become a gigantic fiasco. Or just be not that exciting. As movies tends to be where the new Chinese rich go to blow lots of their money, this could be spectacular for any of several reasons, both good and bad. Whatever the case may be, Robin Li – one of the cofounders of Baidu – is backing Aquamen Entertainment, to be run by Korean director Kim Jeong-Jung and Chinese producer Gary Zhang. 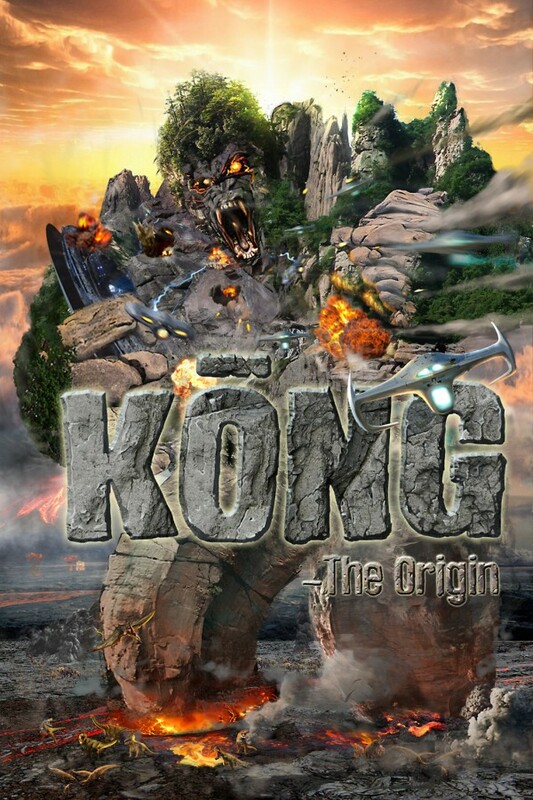 The first feature from Aquamen will be the $40 million 3D CGI Kong, which will give an origin story to Sun Wukong, who according to Journey to the West was born in the Earth’s core. Never fear, there will be aliens and robots, just like in the original tale. Okay, maybe they aren’t in the original tale, but I’m sure they are in the unabridged version. A director will be announced in May, and perhaps by then we’ll have more than just a poster for information. Until then, just keep Kong in your knowledge centers for easy access in case something does happen. Haunted House Elf is what the title of this film translate to. There are little to no records of this hardly anywhere, especially records in English. Whoever did the subtitles decided that the vampires would be called “The Living Dead” He also decided that checking spelling was for pussies and that he was a real man. I’m here to tell you this guy is no real man and probably couldn’t spell “man” correctly if it was tattooed on his hand, much less any other word. There was a period of time where tons of hopping vampire flicks popped up in the shadow of the Mr. Vampire films. Because hopping vampires are wacky, kids loved them, and it was inevitable that hopping vampire kid movies appeared. There was a ton of them at one point, you couldn’t shake a magic paper tract without it hitting the forehead of some hopping vampire kid. Then, like most fads, it quickly died and was replaced with Pokemon or something. Hmph…kids. Wang Chi-Chiang aka Shiao-Chiang (???) – His mom is dead, his dad is a drunk, and Shiao-Chiang has anger at his mom for dying. But he’s too busy trying to please and comes off as a normal kid, which is good. Shiao because means little, as you should know had you seen that Karate Kid remake or speak Chinese. Shiao-Ming (Lin Hsiao Lan) – The daughter of the family that owns the house. We never find out her full name. Not very good at being low-key that they are up to something, but mom is too busy. Lin Hsiao Lan is best known for starring in a bunch of Peach Boy films. Lee Chung-Chiang aka Shaio-Tai (???) – Bratty son of the family that owns the haunted house. Is a big jerk, yells at people for no reason, and the rest of the kids ditch him to go on their comic book adventure. Jerks always finish last, buddy! Tong-Tong (???) – A Hopping Vampire Kid who was trapped in a coffin for 300 years, then gets his new friends trapped in a comic book where they almost die like 50 times. A real friend. Now let’s stake him! Tribal Chief (Wu Ma) – An evil tribal chief who is about to feast on some princess when these kids and a vampire show up in his comic book story and ruin the plot. Tribal Chief switches more costumes than an evening of Saturday Night Live trying to defeat the invaders, but eventually dies when the comic book burns up. Screw The Boy and screw his Magic Box, the only reason you should see this film is for all the freaking weird monsters that show up! We got dinosaurs, we got three-headed guys with swords, we got dinosaurs with beards, we got flying monkeys, and we got unofficial Japanese Kaiju cameos. Sure, most are defeated by some kid, but the monsters are the reason to watch because monsters rule and stupid kids drool. This is the THIRD Taiwanese film we have watched with giant monsters that has a kid running around like he is Kung Fu Superman (Flyer of Young Prodigal and Young Flying Hero are the two others) so I can only conclude this is a popular genre in Taiwan and there may be many more such films waiting to be uncovered. And many more annoying pseudo-Kennys. Oh, well. So let’s get to seeing these monsters! The only evidence of the film seem to be a few entries on film databases, most of which is in Chinese. So what we have been able to find out is this is a 1975 Taiwanese production, and the two surviving prints (by prints I mean VHS tapes that have been dubbed to DVDR) have either subtitles in Korean or cropped off English subtitles that you can’t read. So, essentially, no subtitles. But at TarsTarkas.NET, we don’t need no stinking subtitles! I am guessing a widescreen remastered print is too much to ask for, especially since this is probably a children’s film. I hope some day 35 years from now a Chinese neo-blogger is reviewing Elmo’s Potty Time as if it is a serious film. Because, then, I win. TarsTarkas.NET victory! Hey, no subtitles and a confusing script lead to confusing reviews. So just go with the names we made up for everyone, it will help you in the long run. And this review got bumped up a bit to answer the challenge thrown down by Todd at Die, Danger, Die, Die, Kill over Taiwanese kaiju films. Your move! The Kid (Choi Foo-Gwai) – The Kid is the product of love, too bad for his parents who are torn apart by fate. And then royal guards try to kill him when he is saving his little brother, but he is rescued and trained in the martial arts, which come in handy when a batch of dinosaurs try to kill him. Everyone tries to kill him, but at least he has a magic box. Because otherwise, The Kid would be The Dead. Choi Foo-Gwai spends most of the film emoting with various pained faces of rage. Wong Lau Yeh (Leung Sau-Geun) – The father of The Kid who can’t be with the mother Yeung, what with her being one of Monkey King’s brides. So he heads off to marry some other lady and then does nothing else. Yeung (???) – Yeung is The Kid’s mother and the lover of Wong Lau, except she’s been promised to Monkey King! So she gets thrown into Heaven’s jail. Bet you didn’t know Heaven had a jail! Old Guy (Cheung Kwong-Chiu) – Old Guy is Yeung’s dad and let’s his daughter get with Wong Lau Yeh after misreading a book or something. That turns out to be a problem when she gets knocked up. One of the few actors I identified. Monkey King (???) – Monkey King is the Monkey King of Journey To The West fame. Has magic Pregnancy Detection Eye Rays. Triclops (???) – Possibly named Ar-lang, Triclops guards Heaven from invading punk kids and pregnant fiancees. His magic third eye gives him the name I gave him, inspired by He-Man.